Excitement of visiting Golden Triangle Tour doubles when the adventure of Ranthambore wildlife comes together. Golden Triangle Tour with Ranthambore is a perfect 07 nights & 08 days program in which you will encounter some of the India’s finest monuments and rare wildlife Tiger safari. The tour starts with visiting capital city of Delhi and heading to Jaipur which is capital city of Rajputana land of Rajasthan. Taking the journey to adventurous turn the tour will leads you to Ranthambore. You will get an opportunity to go on game drive and have a glimpse of Indian Tigers. Your excitement get doubles when you will reach to city of Taj Mahal, Agra. The journey will finish with bunch of sweet and memorable memories. You will be greeted with a smile and professional expertise by Plan Our Travel India Pvt. Ltd. at the airport and assisted to transfer and check in at the hotel. After freshen up proceeds to explore the charm of Old Delhi. This part of city is a showcase of India’s pre Independence touch and feel. The crowd has increased, few more shops has opened rest the buildings, streets and old areas still reminds the uniqueness of the area. A short rickshaw ride will take you to inside the Chandani chowk market where you can buy Indian Traditional dresses, cameras etc on good rates. Paranthe wali gali is another must visit place around the area. Dinner at Chor Bazaar restaurant will make your visit to Delhi a great experience for sure. Morning after breakfast start your full day sightseeing tour to Delhi. The city is designed by famous English architect sir Edwin Lutyen. The tour will start with sightseeing visit of Humayun’s Tomb. The tomb is an example of finest art. Next move to drive pass of Rashtapati Bhawan and India Gate. Stepping ahead to Qutub Minar, the gift of 12th century and a remarkable monument –Qutub Minar is must visit monument of Delhi. Later visit Lotus Temple-A structure symbol of International peace and brotherhood. 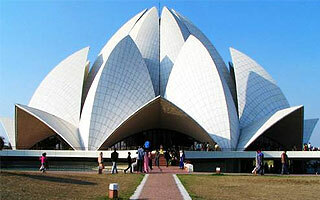 The visit to lotus temple will add on the charm and grace to your tour. Morning after breakfast drive to Jaipur, the princely city of Jaipur welcomes you with its Pink colored walls. Simplicity and tradition is in the air of Jaipur. On arrival check into the hotel. Have some rest and after freshen up proceeds to explore the city. You have various option today to make your evening worth. You can plan to go Chowki Dhani-a rural themed village developed to showcase Rajasthani culture and giving the guests opportunity to taste the delicious Rajasthani cuisine. If you are adventurer by nature then you can book your Hot Air Balloon ride and can explore the city from sky. Morning after breakfast drive to Amer to visit Amer Fort. Amer fort is a grand fort and from Parking you have option to take either Elephant Ride till to top of fort or can take jeep also. By walk is always a option with the guests. Beautifully decorated elephants enhance the charm of ride and once you will feel like you are a king and riding on your personal wagon. The Amer Fort is an live example of supreme architecture and luxury life of prince of that era. After Amer fort return back to city and make a drive pass visit to Hawa Mahal, the magnificent five stories Pink building will keep your eyes stuck into its gracious design. Later visit Jantar Mantar which is an observatory which stills in operation today. The observatory is a live example of mastery. You next stop will be city Palac, you will amazed with the beautiful palace located center of the city. After city palace visit Albert Hall Museum, the museum have rare collection of artefacts and many other things related to Indian history. Evening is free to explore local market and shops of Jaipur. Rickshaw ride to market will enhance the charm of your visit. Morning after breakfast start your drive to Ranthambore, on arrival check into the hotel. Ranthamore is a National park famous for Tigers. It is one of the few parks where the tigers are in very good number and enjoy their Rule and jungle hood. You can book your evening safari. As when you are in Rathambore you should utilize every single chance of watching the tiger. You have option of choosing canter or Jeep Safari. The game drive will be thrilling and full of adventure. Being lucky you would spot the tiger. Morning proceeds for early morning safari of the national park. Early morning chances are vey high of spotting the tigers. The park is very famous among wild life photographers and lover of flora and fauna. You will also explore the great Ranthambore Fort some time tigers can be spotted resting there. You can also book your evening safari to Park. The park is among the top and finest national parks where the tigers are preserved in their natural habitat. Best time to visit the Ranthambore National park is from October to March & April. During monsoon and summer the park is been closed for Public. Morning after breakfast drive to Agra, visit Fatehpur Sikri enroute. Once the residence of Akbar specially built as his new capital is now historically and architecturally important. Its magnificent Buland Darwaja, Akbar Palace, Paanch Mahal are worth to visit. After visiting Fatehpur Sikri continue your drive to Agra, on arrival check into the hotel. Evening after freshen up explore local market and shops of Agra. After breakfast and check out from the hotel visit the most splendid and beautiful creation of man that ever have made The Taj Mahal. The white coloured grand structure is nothing less than any dream structure. You will lost yourself in the superb architecture of this amazing monument of love. After Taj visit you can also exlore the grand Agra fort which is great resemblance to red fort of Delhi.